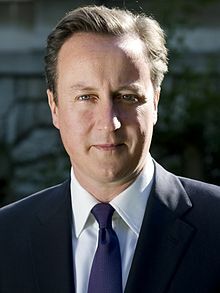 David William Donald Cameron (born 9 October 1966) is a British politician. He was the Prime Minister of the United Kingdom from 2010 to 2016. He was First Lord of the Treasury and Leader of the British Conservative Party until July 2016. On 24 June 2016, following a vote in a referendum to leave the European Union, Cameron announced that he would step down before the October 2016 Conservative Party Conference to make way for a new Prime Minister. After Theresa May became the only candidate in the elections, she became the designated Prime Minister. Cameron later announced he will resign on July 13 and was replaced by May. David Cameron was born in London, and grew up in Peasemore, Berkshire. He went to Eton College, a private school for boys, when he was thirteen. He then studied Philosophy, Politics and Economics (PPE) at the University of Oxford. He has Scottish, Welsh, English, Irish and German Jewish descent. He worked as a researcher for Carlton TV, and as an adviser for Conservative politicians Norman Lamont and Michael Howard. He first became a Conservative Party Member of Parliament (MP) at the 2001 General Election for the constituency of Witney, after making an unsuccessful attempt to become an MP during the 1997 General Election. He briefly entered the shadow cabinet in 2005, before being elected leader of the Conservative Party in December 2005. Cameron led the Conservatives through the 2010 general election, where it received the highest share of the vote and more seats than any other party, but did not get enough votes to form a government by themselves. A Conservative-Liberal Democrat coalition government was formed, and David Cameron became Prime Minister on 11 May 2010. He is Britain's youngest Prime Minister for over 200 years. Since being elected, Cameron's government has declared £6.2 billion worth of cuts to help reduce the budget deficit. He was re-elected as Prime Minister in 2015. His party got 36.9% of the vote, a majority. The Liberal Democrats only got 7.9% so the coalition between the Conservatives and Liberal Democrats ended. On 24 June 2016, following a vote in a referendum to leave the European Union, Cameron announced that he would step down before the October 2016 Conservative Party Conference to make way for a new Prime Minister. Cameron announced he would resign on July 13, after Theresa May became the designated Prime Minister. He is married to Samantha Cameron, and they have 3 children. His son Ivan was born with disabilities and died when he was six. Nancy Gwen was born in 2004. His youngest child, Florence, was born on holiday in Cornwall. Because she was born in St. Endellion, they decided to make her middle name Endellion. He said on Channel 4 News in 2013 that he is a feminist, but some people don't agree. During a debate with MP Angela Eagle at Prime Minister's Questions in April 2011 he told her to "calm down, dear". Many people found this rude, and have used it to show how he is not a feminist. ↑ "Ancestry of David Cameron". Retrieved 2011-04-18. ↑ 2.0 2.1 2.2 2.3 "EU referendum: UK votes to leave in historic referendum - BBC News". Retrieved 2016-06-24. ↑ "Camerons reveal daughter's name". Retrieved 25 June 2016. ↑ Association, Press (2 October 2013). "David Cameron: 'I am a feminist'". Retrieved 25 June 2016. ↑ Cosslett, Rhiannon Lucy (27 September 2013). "So David Cameron is not a feminist. Well, knock me down with a feather - Rhiannon Lucy Cosslett". Retrieved 25 June 2016. ↑ "David Cameron tells MP Angela Eagle: 'Calm down, dear'". Retrieved 25 June 2016. "Hall of Fame: David Cameron". BBC. Retrieved 2011-04-18. "David Cameron". Conservatives.com. Retrieved 2011-04-18. "David Cameron MP". BBC. Retrieved 2011-04-18. "David Cameron MP". Westminster Parliamentary Record. Retrieved 2011-04-18. Reitwiesner, William Addams. "Ancestry of David Cameron". William Addams Reitwiesner Genealogical Services. Retrieved 2011-04-18. This page was last changed on 21 March 2019, at 15:48.